Manufacturer of a wide range of products which include wall mounted lifts. 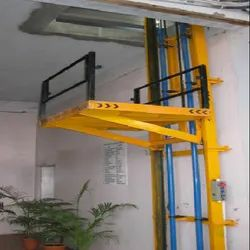 We offer wide range of Wall Mounted Goods Lift. Our offered product is manufactured utilizing high-grade element that is procured from trustworthy sources of the industry as per the defined industry norms. Furthermore, this product is obtainable in different sizes and designs according to the requirements of the clients.